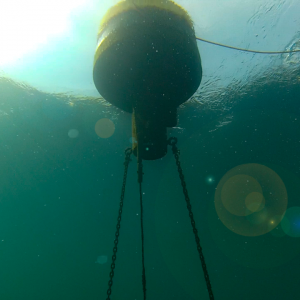 The School of Freshwater Sciences (SFS) operates a number of environmental monitoring buoys in Lake Michigan as part of the Great Lakes Observing System (GLOS). 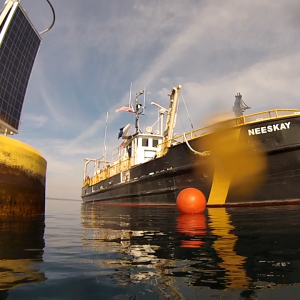 Two monitoring buoys are located off of Milwaukee WI and one is located in south-central Green Bay. Green Bay monitoring is conducted in collaboration with the Fox-Wolf Watershed Alliance (FWWA) and affiliated partners. Additional environmental monitoring of Lake Michigan is conducted in collaboration with the Lake Express high speed ferry as well as the North Shore Water Commission. SFS also conducts environmental research and monitoring in collaboration with the US National Park Service at Sleeping Bear Dunes National Lakeshore and the Apostle Islands National Lakeshore. These monitoring programs produce a variety of data including over-lake weather measurements, wave height, current speed and direction, and water quality measurements such as temperature, conductivity, oxygen concentration, carbon dioxide concentration, pH and chlorophyll concentration. 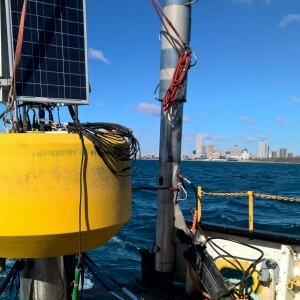 The overall objective of this GLOS effort is to increase Lake Michigan observing capacity, which will lead to improved wave forecasting, over-lake weather forecasting, and circulation modeling. The monitoring systems also provide data for the validation and improvement of air quality (ozone) forecast models, monitoring of long-term changes in nearshore water quality, and water quality decision support tools for managers at the municipal, state and federal levels.